Rarely do we come across books on musical instruments. And one covering the whole gamut of Indian classical musical instruments is practically unheard of. 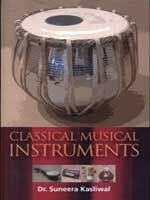 This book by Dr. Suneera Kasliwal covers almost all instruments in vogue in the classical music scenario of southern and northern India. Apart from developing deep into the history and evolution of each of these instruments, this well-researched book deals with their structural and manufacturing details and the basic techniques of sound production. Beautifully illustrated, this book is recommended for all those who have genuine interest in indian classical music and instruments. Born and brought up in Jaipur, Rajasthan, Dr. Suneera Kasliwal is a renowned sitar exponent. She had her early training from Dr. Sharda Mishra of Jaipur. Later she became a disciple of late Pt. Lal Mani Mishra, the famous vichitra veena player and renowned musicologist of Banaras Hindu University (BHU). A gold medalist in Master of Music from BHU, she completed her doctoral programme under Dr. K. C. Gangrade. In 1987 She became a disciple of Pt. Uma shankar Mishra, under whom she is still learning the intricacies of sitar playind of Maihar Gharana. A recipient of the Sur Mani Award, she was awarded the Pt. Omkar Nath Award in 1979. A regular contributor to AIR, Doordarshan and music journals and magazines, Dr. Kasliwal is currently a senior reader in the Department of Music, Delhi University.